The ParaPro Assessment is a Praxis exam designed for practicing and prospective paraprofessionals in the field of education. The ParaPro Assessment measures test-takers’ knowledge and skills in basic content areas, such as reading, writing, and mathematics. The aim of the ParaPro Assessment is to ensure paraprofessionals possess the requisite skills and knowledge to perform well while assisting teachers in classroom instruction. Some states may require the ParaPro Assessment; to be certain, make sure to check your state’s website, or the ETS State and School District Requirements listing on the ETS ParaPro website. Prepare with our ParaPro Study Guide and Practice Questions. Print or eBook. Guaranteed to raise your score. Get started today! How much does the ParaPro Assessment cost? The ParaPro Assessment will cost $55 at registration. The $55 test fee is nonrefundable, so make sure to plan ahead when you schedule your test date. If you need to retake the ParaPro Assessment, you will need to wait at least 21 days. Contact ETS to determine any additional fees associated with retaking the exam. What is the passing score for the ParaPro Assessment? Passing scores for the ParaPro Assessment are dependent on state requirements. Many states require the ParaPro Assessment and minimum passing scores range from 455 (Virginia), to 467 (Texas, Education Service Center, Region 19). To ensure you know the minimum score you need to earn, make sure to check your state’s website, or the ETS State and School District Requirements listing on the ETS ParaPro website. What does the ParaPro Assessment cover? ParaPro Flashcards. Proven ParaPro test flashcards raise your score on the ParaPro test. Guaranteed. The ParaPro Assessment is a computer delivered exam consisting of 90 selected-response (multiple-choice) questions divided into three different content areas: reading, mathematics, and writing. You will be allotted 2.5 hours to take the test in its entirety. Although basic content knowledge will be assessed, about one-third of the questions in each section of the ParaPro Assessment cover the application of basic knowledge and skills in the classroom. Please make note that calculators are not permitted during the mathematics portion of the exam. Additionally, the test may contain pilot test questions that are unscored; however, you will not be able to tell the difference between scored and unscored questions, so make sure to answer each question to the best of your ability. The most effective means of preparing for success on the ParaPro Assessment is to make use of the most comprehensive test preparation materials available to consumers. The foremost provider of test preparation materials for the ParaPro Assessment is Mometrix Test Preparation. 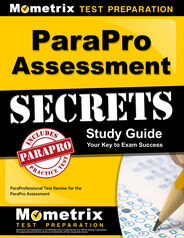 Mometrix has included everything you need in the ParaPro Assessment Secrets study guide, including authentic ParaPro Assessment content, as well as expert test-taker tips to help you ease test anxiety, improve memory and recall, and pass the ParaPro Assessment on your first attempt. The ParaPro Assessment Secrets study guide also includes step-by-step tutorial videos designed to boost your overall test performance. Along with the ParaPro Assessment Secrets study guide, Mometrix also offers a complete, comprehensive ParaPro Practice Test and a complete set of ParaPro Assessment Flashcards. Take the most direct path toward passing the ParaPro Assessment on your first attempt: read the ParaPro Assessment Secrets study guide, improve your memory with the ParaPro Assessment Flashcards, and test yourself with the ParaPro Practice Test. Paraprofessionals play an indelibly important role, and the ParaPro Assessment is your ticket to the classroom. Don’t delay, get started today! Explore our free ParaPro review provided by Mometrix. Check out our premium ParaPro study guide to take your studying to the next level. If you benefit from these materials, just click the link below! 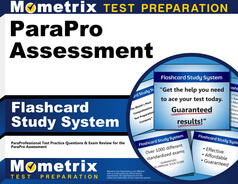 To compliment our ParaPro book, we also offer extensive ParaPro flashcards for even more ParaPro test prep help. We hope you enjoy our products! Your purchase helps us make more great, free ParaPro certification content for test-takers just like yourself.